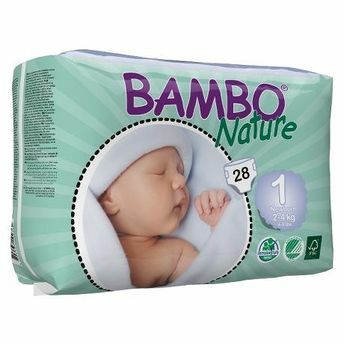 Bambo Nature is one of the most environmentally friendly eco-nappies for newborn babies weighing 2-4 kg. These diapers are made from premium-quality fabric and material that represent the new generation of environmentally-friendly diapers. It is manufactured in a production facility where 95 % of all production waste is recycled. Furthermore, Bambo Nature is labeled with the Nordic Eco-label and it is also dermatologically tested. All Bambo Nature Nappies are latex free. About the Brand: Bambo Nature is the new generation of environmentally friendly children's products! Their Nappies and Training Pants come with a super soft top-dry layer which quickly wicks away wetness from your baby and, locking it into the core, along with the fully breathable back sheet, Bambo Nature nappies give the most premium care for your baby's skin. They are also dermatologically tested and boast of their thinnest ever core design, which doesn’t compromise on performance or comfort, allowing your baby to move around freely and minimizing the risk of any unwanted leakages. Bambo Nature is skin-Friendly, eco-friendly and sleep-friendly. For over three decades, Bambo Nature has taken every measure to bring you a premium baby nappy that's gentle, soft, and made of eco-friendly materials. Explore the entire range of Diapers available on Nykaa. Shop more Bambo Nature products here.You can browse through the complete world of Bambo Nature Diapers .